When you spot that a cosy pub in a beautiful part of the world will be hosting a vegetarian night, what can you do but book a table and plan to spend the day in the area? The Cat Inn is in the sleepy Sussex Village of West Hoathly and welcomes locals, diners and walkers alike with a roaring log fire and an excellent menu. When we called in for a break during a walk, we were delighted to see they were hosting an evening with a special vegetarian menu and providing us with an excuse for a visit! Our starters were a delicious and richly flavourful borscht (a Ukrainian beetroot soup) served with sour cream and feta and watermelon salad, which turns out to be a gorgeous combination! For mains we had a rich and satisfying wild mushroom tart, with rocket salad and a great mixed platter of felafel, tabbouleh and fatoush (a Levantine bread salad) with a butter bean hummous. we loved both, but we noticed that the other item on the menu, a curry served with naan and popadum seemed to be the most popular amongst the other diners! Our desserts were both gluten free – a chocolate torte served with blood orange sorbet and an almond cake with pistachio ice cream. I would say the almond cake won the awards as it was wonderfully moist, but the rich chocolate of the torte demands a special mention. It was a very successful evening and the menu showed imagination and a willingness to experiment, while clearly paying respect to a clientele who may be suspicious of a whole meal out being vegetarian! I would however like to encourage the Cat Inn and other restaurants and pubs to put their thinking caps on and come up with other veggie menus – it certainly didn’t seem to keep people away from the Cat Inn anyway! As well as this lovely pub, the area is full of fantastic views, historic houses and open spaces galore. We visited the National Trust house, Standen, a late victorian home designed Arts and Crafts movement member, architect Philip Webb. Both house and garden were calming and inspiring, with views across the Sussex countryside. We also walked in Ashdown Forest, which, aside from being the largest free public space in the south east of England, is famous as home to Winnie-the-Pooh! Standen - the house seen from the croquet lawn. Some of the city’s history is dark. 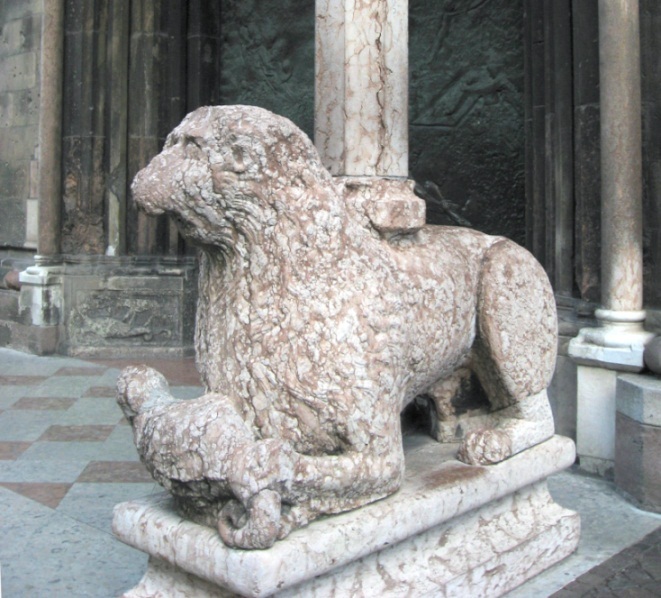 Having been part of the Austro-Hungarian empire, it was annexed by Italy after World War I. It was mostly German speaking at the time, but underwent an intense period of ‘Italianisation’ under Mussolini during the 1920’s. During World War II the city was held by the Germans until the end of the war and for nearly a year there was a Nazi transit camp here. Today the city is rather serene, with beautiful architecture set against a dramatic mountain backdrop. 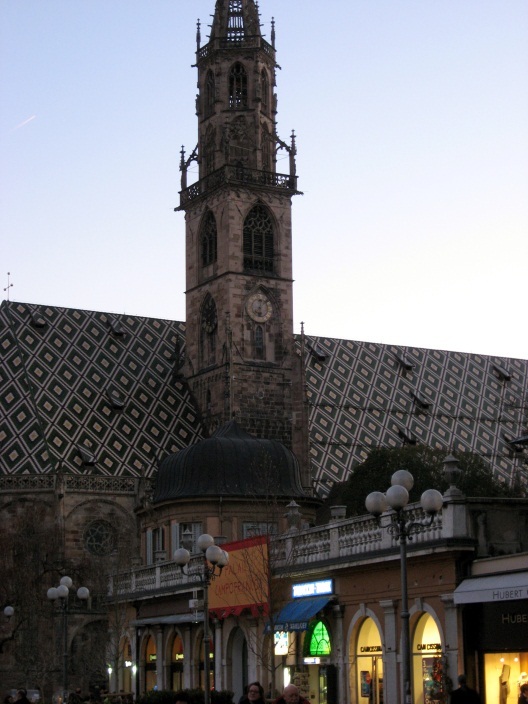 The Duomo in the corner of Piazza Walther, completed in 1420. 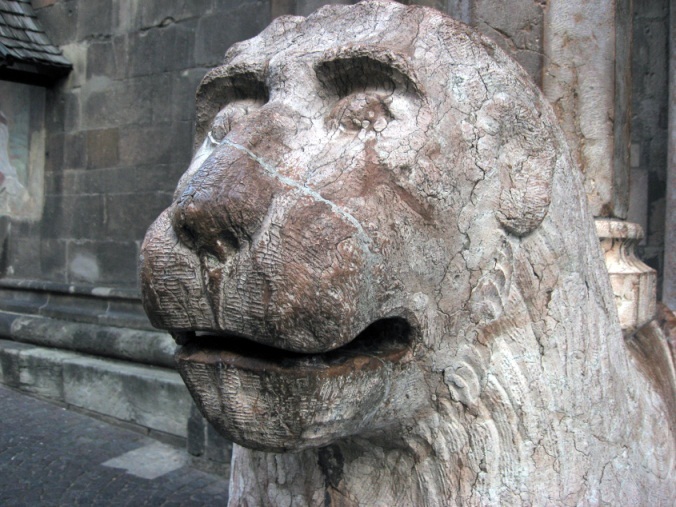 One of the two lions holding up the porch columns of the Duomo. 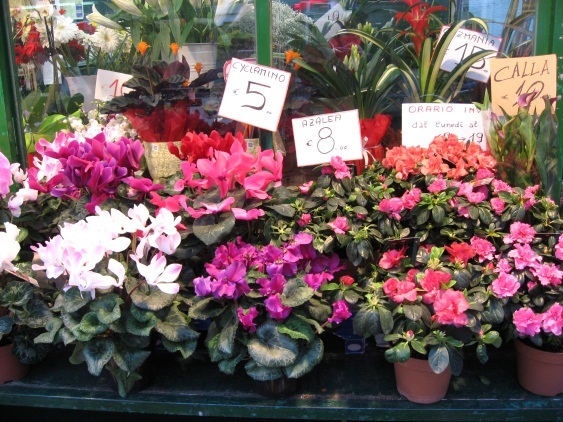 The Obstmarkt on Goethe Strasse. 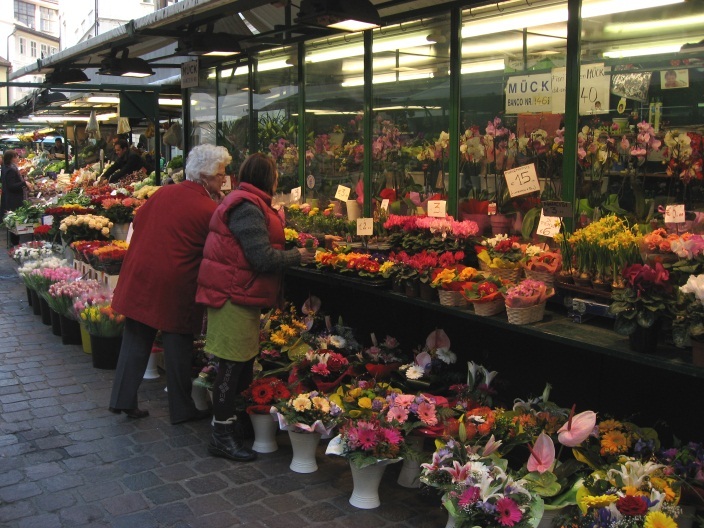 This famous market is open 6 days a week selling food and flowers. 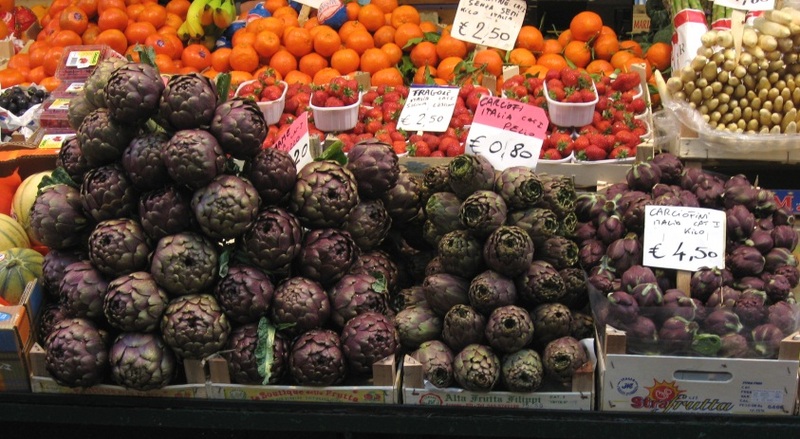 Carciofi and carciofini (artichokes) at the Obstmarkt. 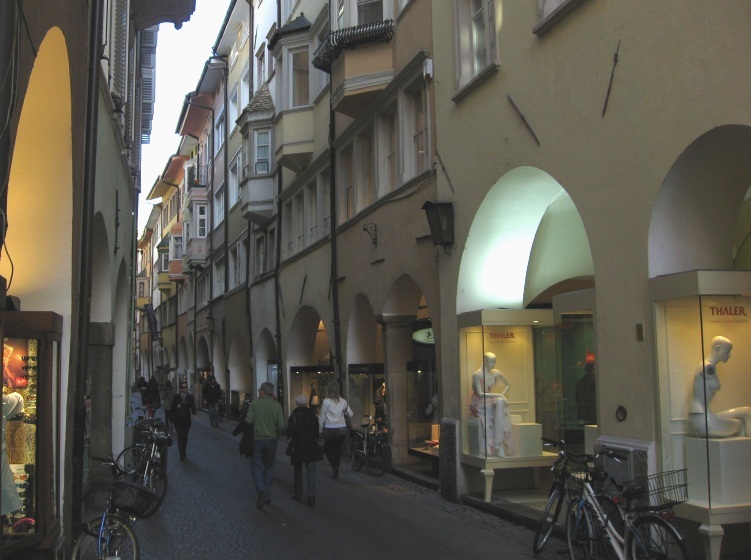 The famous Laubengasse or Portici – the heart of the medieval commercial centre, with its historic arcades and archways. A chemist shop on the Laubengasse. Advertising the Walter opticians on the Laubengasse. The historic Amonn House on Rathausplatz (Town Hall Square), at the end of Laubengasse. There’s a beautiful park and walkway alongside the River Talvera / Talfer, with a view up to the Dolomite mountains. The walkway leads from the bridge in the city centre. Maretsch Castle, from the 13th century. The vineyard within its ancient walls grows Lagrein grapes. The castle is only about 5 minutes walk from the Tafferbrucke bridge along the river walkway. An evening view from Piazza Walther / Waltherplatz.